Now that you’ve spent the weekend contemplating our latest online content... get ready to come celebrate the launch of our 2019 print edition, Negative Space! Mark your calendars: 6-8pm, Wednesday, May 1st on the 6th floor of the Diana Center at Barnard. Snacks, drinks, art, and community — what more could you ask for on a Wednesday night as you gear up for a strong finish to the semester!? We’re also thrilled to share another online exclusive — this time, an essay by @blakeyhcb — while we put the finishing touches on the print journal. Who is Friedel? Can he hear you? Navigate over to journalofartcriticism.com to find out. JAC editor Cornelia Smith interviewed Susan M B Chen about artist-run galleries, the Chicago art scene, and how social media affects creative practice. Check out their conversation on JAC’s website — link in bio! 📖 Image: Beyond the Border, 2018. Submissions to our 2019 journal are due at midnight tomorrow, so make sure to get them in ASAP! We publish art and art criticism by undergraduate students from across the country and world, creating a community of like-minded emerging artists, writers, and editors. Sound like something you’d like to be a part of? See the link in our bio for detailed submission guidelines and send your work to journalofartcriticism@gmail.com. 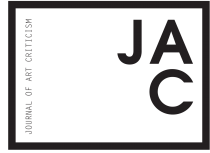 January 21st is the deadline to submit to the 2019 edition of JAC. Still not sure what to write about? Check out our 2018 edition, “Surface Tension,” for inspiration.